Home » Blog Posts » Socks and Spinning and Fleeces OH MY! 1) My friend Beth Smith’s new book is out!!! 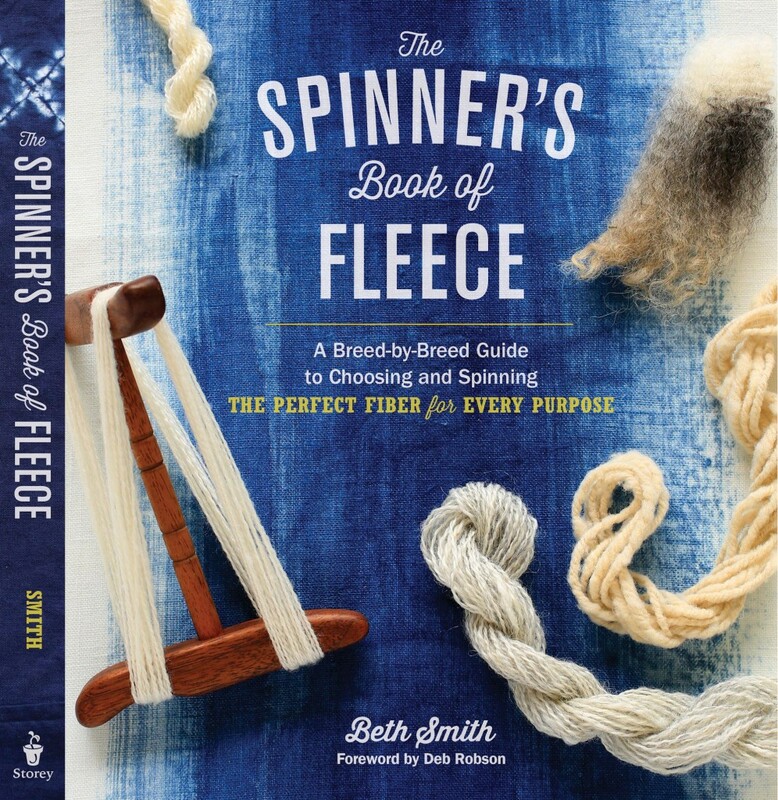 You can pick one up at The Spinning Loft (I just ordered mine this morning). This is Beth’s new book! So Exciting! 2) I am highly suggestible, so I also bought The Field guide to Fleece, and a Fleece Sampler. Or maybe it is because it is summer, which is prime time to wash fleeces. Or maybe it’s because I’m crazy. One of those. 3) I’m still chugging along on my Mojo Socks. I finished the first one, and I’m at the part where I start putting in a gusset on the second one. The blue marker is where I started the body of the sock. It also marks the instep side of the sock. The orange marker is where I started my knitting yesterday. It gives you an idea of what I get done on two train rides worth of knitting. It’s not much, but every stitch is progress towards completion. Also, you’ll notice that they don’t match. That’s by design. It’s written into the pattern that way. It’s not unusual for me to wear two completely different hand knitted socks (I have a pair that is that way because I got bored with the yarns and stopped, and another pair that is that way because one of each pair developed a hole), so I’m sure they won’t drive me crazy. I know people for whom the mere thought of two unmatched socks is crazymaking. This is not for them. 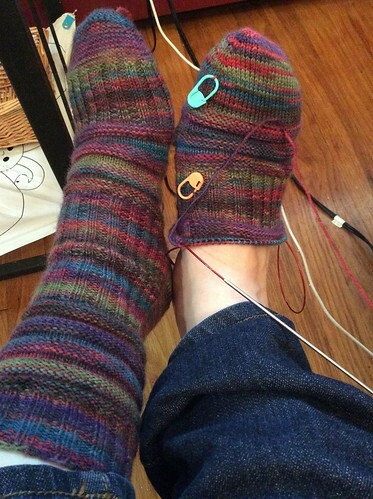 4) I’m still at the stage where I can’t think past small projects like socks, or finishing Cori’s rainbow sweater. Hrm. I need to finish Cori’s rainbow sweater before she starts school in September. She and I both like reading “Annie and the Swiss Cheese Scarf”, and like the fact that Annie gets a new sweater for school each year. 5) My friends are finishing up their Master Spinner Level 2 class today, and I’m a little disappointed that I’m not there. I can’t imagine being away for a week right now to do it though, so I’m also glad that I withdrew. I need to finish up the last of my homework and submit Level 1, and then I’m going to be done with Master Spinner stuff for a while. 6) That’s because I start school in September. School stuff doesn’t belong here, so I’m going to put it on another blog, elsewhere. I’ll mention where after I have it set up and running. 7) I have a review of another type of Needle Keeper coming. Stay tuned. I think I’m out of things for my list. 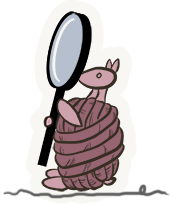 I’ll be back next week with that review, and maybe a view of the fleece sampler from The Spinning Loft. Yay!